The Perfect Pineapple contains a high source of Vitamin C, which drastically aids the immune system to fight off colds and sickness. Vitamin C is a powerhouse for improving immunity and is also paired with the anti-inflammatory properties of bromelain in pineapple. 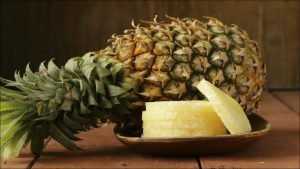 Bromelain is a unique enzyme found in pineapple and is often utilized to reduce swelling, especially in the nose and sinuses. This means that consuming fresh pineapple can help to naturally clear up a stuffy nose when you’re feeling under the weather. Not only does bromelain help reduce inflammation, it also works to fight off infection and to eliminate bacteria. This means that the perfect pineapple can not only help you get back to feeling well when you’re sick, but it can also help prevent sickness. Bromelain also works to combat respiratory illnesses, including coughing, bronchitis, asthma and pneumonia. The easiest way to ward of sickness with pineapple, is simply by consuming the fresh fruit. Additionally, drinking pineapple juice helps to soothe a sore throat while aiding the body to expel mucous easily. Fresh Chestnut Hill Farms pineapples can also be transformed into a natural “cough syrup” to help suppress coughing and soothe a sore throat. Simply mix the above ingredients to create your own homemade pineapple “cough syrup”. Those who use this natural remedy recommend drinking a 1/4 cup up to three times a day for best results. Here’s How to Make a Delicious Pineapple Dessert to Combat Colds! This entry was posted in Recipes, Tips & Tall Tales and tagged chestnut hill farms, health facts, healthy living, healthy recipes, pineapple, pineapple facts, recipes. Bookmark the permalink.